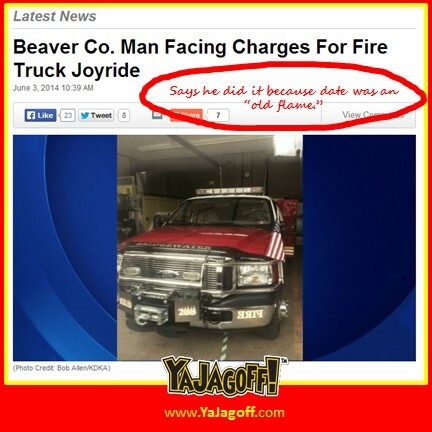 So when you read, “Guy and date steal fire truck for joy ride,” how old where you thinking the age of “guy” was… 16? 19? College fraternity-stunt age? How about 46 years old! Randy Davidson, 46, is accused of stealing the keys to the fire department rescue truck and taking the vehicle on a 30-minute joyride with a female friend last week. This story was initially filed by our Jagoff-catching buddy and un-official Beaver County Jagoffery Bureau Chief, Kristen Doerschner. Her link at the Times On Line is blocked behind a subscription thingy but here’s the KDKA-TV story. So Randy sneaks into the fire department late at night, knows where the keys are and heads out for a little jaunt in the fire vehicle with his honey-boney. No word on her age but clearly, since she didn’t stop Randy from this bad decision, her I.Q is about the same as his. I’m guessing that most of the high-end flea markets were closed at that hour so grabbing a fire truck was the next most exciting thing to do that night. I wonder if he put the windows down, leaned into the center for a low ride and BLASTED the bass on the emergency dispatch radio to look REALLY cool. Check me aht babe! I’m dope as a Fahr Chief boy! Whoop! Whoop! (then he fist pumps her) as he makes fake siren noises driving down the road. I wonder if, after they parked the fire truck, he took her to the Brighton Hot Dog Shoppe or if he went all kinda crazy and treated her to a high-end Hoss’s Steak House buffet? Of course, maybe they continued the crazy-kids-kinda-night and he splurged on a McDonald’s Dinner Box. Hey Fireman Randy….I hope the night didn’t end in an embarrassing way with your date belittling you by yelling, “You need more hose.. more hose!” Good luck on your next joy ride to court in a real police car, Ya Jagoff!